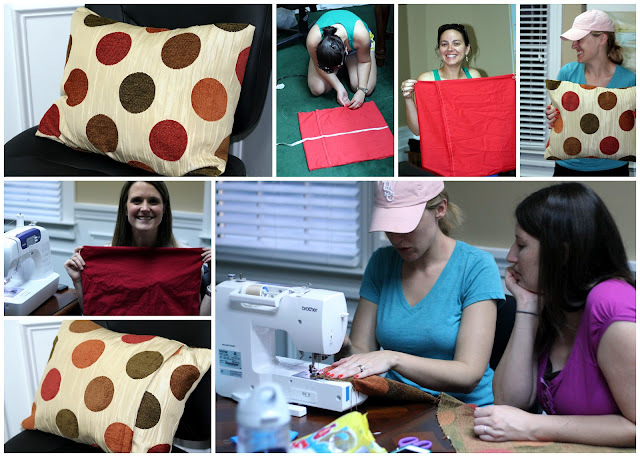 Tonight, I offered my very first Sew Classy Sewing Class!!! Seriously all of my prayers were answered! It was the perfect class to start with! All of my students, I knew somehow and they all did a fantastic job and really made it so easy to teach them! Check out my awesome Sew Classy Students! We held the class at The Mather Company, which is my husband's real estate company! Their conference room was just the right size for our little class! We ended up sewing an envelope back style pillow method where you use one continuous piece of fabric like this tutorial at Take The Side Street , not cut 3 pieces and sew around like I am used to, and it went so well! They loved that method and were excited to go home and try it again! The first hour was spent working individually on each girl's machine! They learned how to thread their machines and wind bobbins and we kind of went over how to change stitches, etc. I was so nervous about figuring out other types of machines, but honestly they were all so straight forward and while we did have to look up one person's automatic thread cutter in their manual, it all went smoothly! After that we cut fabric, ironed, and sewed! They did fantastic! Carla, my sewing mentor, who's 3 year old son basically helped name Designs By Sessa, came to help and I was so glad she was there! I definitely felt more confident with someone else to help where needed! Thank you, Carla for EVERYTHING!!! I really just give God all the glory. I felt completely in my element teaching AND sewing and sharing this love with other people! It's just so neat to see other people's light bulbs go off and gain confidence at something! It gave me confidence seeing how much I really do have to share in this area, too! I definitely want to do this again next month and offer another beginner, beginner class. Then, maybe after that we can branch out and do some more "advanced" type things where less time is spent focusing on handling the machines! I plan to form classes on interest and projects and am thinking mid to late June, so please let me know if you want a spot! Thanks so much to all that came and shared in on this fun! I had a blast teaching you!